E-LAMP: Travellers and technology. Guest Contribution by Ken Marks. Have you ever thought about the mismatch between mobile communities and the pattern of locally-based schools which we all take for granted? 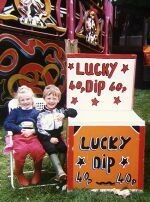 The largest traditional communities are Gypsies, Irish Travellers, Scottish Travellers and 'Showmen' (the traditional name used by the Fairground community). Their problems started back in 1880 with the advent of compulsory school attendance (two years earlier in Scotland). Current legislation now allows for flexibility in terms of school attendance for children whose families are nomadic, but ICT is beginning to be used to build bridges and to challenge the notion that their schooling equates to physical attendance at school. Since 2004 there have been a series of E-Learning and Mobility Projects (E-LAMP) which have sought to link pupils back to their 'base-schools', which are generally situated where the family overwinters. The projects have supplied them with laptops and datacards. The first project was research-orientated and sponsored by the Nuffield Foundation, but the DfES has also put resources into three subsequent projects so that over 200 children are now involved in a series of pilot activities. There are also parallel developments beginning in Scotland. This approach has worked well with primary age children but, as you might expect, has been more problematic with secondary schools. There are problems for the secondary phase both because children have to link to a series of specialist subject teachers and because the children and families are much more cautious about committing to secondary education. This is partly because of bad experiences of bullying, prejudice and racism and partly because Traveller children are regarded in their communities as young adults by the age of 13/14. They then link into a form of family apprentice model for their vocational education. [Even where parents encourage children to attend school exclusions at this stage are also all too common.] This has lead to another E-LAMP project aimed at 'Key Stage 4' youngsters who are permanently disengaged from school. This project uses an on-line distance-learning platform and the children are given tutorial support by specialist Traveller Education staff. Great to see technology actually supporting a traditional lifestyle! Ken Marks works for the University of Sheffield's School of Education. For more information see this fuller report on progress, last updated November 2006 [65 kB DOC], or contact k.marks [AT] sheffield.ac.uk. "The Scandinavian entrepreneurs behind the wildly-popular services Kazaa and Skype are about to launch an internet television service. The advertising-supported service will comply with copyright laws, the pair said." "Janus Friis and Niklas Zennström say that the new business, which is codenamed The Venice Project, will be based on a peer-to-peer (P2P) network, like Kazaa. Kazaa was a file-sharing network widely used to pass unlicensed copies of music tracks around the internet, but Venice will only distribute licensed content, the founders said." See also Venice Project would break many users' ISP connections, from The Register. Frank Coffield caught my attention some years back when he was based at Newcastle University. In 2004 Frank and his team "did for" learning styles inventories with the two research reports they produced for the then Learning and Skills Development Agency, most of whose functions are now within LSN. Frank also wrote sceptically, but as a critical friend, about some of the incoming Labour Government's more aspirational policies on lifelong learning. "Charting the impact of government policy on practice has not been, however, a simple matter of recording linear, evolutionary, coherent or cumulative progress. Rather, the processes of change have been complex, uneven, dynamic, ambiguous, hotly contested, and often contradictory. Policies have not only evolved or been radically altered, as Secretaries of State and senior civil servants have come and gone, but some polices were abandoned, while others were from the start internally inconsistent or flatly contradicted existing policies." "In all the pelting torrent of official documents which have flooded the sector since 1997, there is, however, one significant silence: there is no discussion of, and not even a definition of, the central concept of learning, although the word 'learning' is pervasive in such texts and deliberately used in preference to the term 'education'. And yet the whole programme of reform is dependent on some unstated notion of what constitutes learning, and, especially, how we become better at learning. The implict model is a simple input-output one; and government concern to improve the quality of everyone's learning has not spilled over into an interest in learning itself. No learning society is likely ever to be created in the UK or anywhere else without an appropriate theory (or theories) of learning." For me the best parts of the paper that went with the lecture are its diagrams [130 kB PDF]. These clearly identify the excessive number of levels (10) between learners and central Government (I wonder if there are that many in China? ), and the extreme complexity of the policy and planning landscape, and the lack of democratic accountability. Learner-centred it certainly is not. 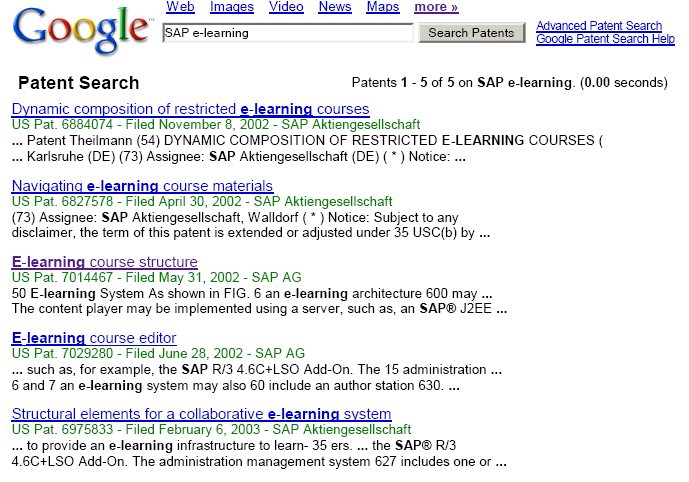 Thanks to Michael Feldstein for mentioning Google Patent Search, which looks to be new. Above you can see a screen shot showing the sort of initial output you get from it. (Alternatively, here are the actual results using the same search term.) Underneath each of the links is a well structured, quick-to-load rendering of the full text of each patent, with nicely organised, clear representations of any images in the original patent application. Here, for example are the results for a 1997 patent about role based access control. Currently Google Patent Search only covers the 7 million patents that have been granted by the US Patent and Trade Mark Office, as the FAQ page explains, alongside a clear outline of its powerful advanced search capabilities. Out of the blue, Boateng Neezer, Chief Technology Officer of the Wireless Ghana project sent me this 35 page in-depth case study [1.2 MB PDF], which was commissioned by and developed for the World Bank’s infoDev group. Train rural schoolchildren and teachers in the use of Information and Communication Technology (ICT). Empower rural communities by providing access to information and breaking the isolation. Provide and use ICT to help increase direct participation in development and decisionmaking processes at local and national levels. Help to make Internet access in rural communities a reality. Whilst much of the case study has an educational and organisational focus, some of it will interest readers who understand wireless networking, with a clear description of the practical solutions being found to overcome difficulties like poor and unreliable power supplies with voltage fluctuations, and an innovative "mesh" network architecture developed by the US Champaign-Urbana Community Wireless Network which describes itself as "the worldwide leader of dynamic wireless mesh networking software". Seeking your views on "personalised learning"
In 2003 I got roped in to do a workshop at the South West e-learning Conference. The topic was "Embedding the skills to teach on-line - is it technical or personality skills that are needed?" I based my handout for the session on a straw poll I did with a range of people with know-how. The handout [90 kB PDF] was well received. On 17 January I will be giving a presentation at a Learning Lab seminar, for which the overall title is: "Personalised learning through ICT", with the overview: "Personalised learning is a much over-used term. This seminar will explore what this term means from the viewpoint of public and private sector organisations." The straw poll approach worked well 3 years ago and I have rather rashly told Learning Lab that I'm going to use the same approach on 17 January. If you would like to help, please comment in response to this post, concentrating, if you would, on the following 4 questions. If you would prefer not to respond in the public domain, you could send me an email using the the questions below as headings. My email address is seb@schmoller.net. 1.3. In any other role you happen to have? 2. Is personalised learning a fruit-fly or a tortoise? (Fruit-flies are ideas that disappear as quickly as the arrive. Tortoises, in contrast, stick. ) Please give reasons for your choice, and thanks to Donald Clark for this dichotomy. 3. If you were observing learners learning, how could you tell if their learning was personalised? 4. How you want to be designated in the handout. "Blackboard, a US maker of online learning management systems, recently took the academic community by surprise when it announced it had been granted a broad patent in the USA. The patent covers 44 claims related to learning management systems and implicated infringement by many other products on the market. On the same day that it publicly disclosed its patent, Blackboard started a patent infringement suit in a Texas court against Desire2Learn. Many companies that have been working on educational software are now concerned that Blackboard will either sue for infringement or enforce complex and expensive licensing agreements." What's the state of ICT access around the world? 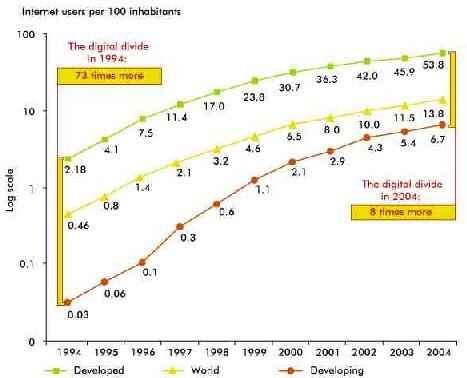 Thanks to Dave Pickersgill for this link to the World Summit on the Information Sociey's Digital Divide at a glance web site, which seems to have last been updated at the end of 2005, and which contains a wealth of data and charts, mostly much less blurred than the one above. "a very effective trial lawyer summing up his case before a jury, and a corporate attorney reaching for a compromise"
"Not many academic lawyers start off as programmer/analysts with IBM, and then switch to law. Eben Moglen is now Professor of Law and Legal History at Columbia Law School, and acts pro bono for the Free Software Foundation. For interesting samples of Moglen's views, see The dotCommunist Manifesto and Freeing the Mind: Free Software and the Death of Proprietary Culture." Moglen has come to the fore as the lawyer behind the Free Software Foundation's ex parte application for a re-examination by the US Patent Office of the Blackboard Patent. On 6/12/2006 Moglen gave the keynote at the Sakai Conference in Atlanta, and later on in the day he and Matt Small, Blackboard Inc.'s General Counsel, took part in a debate about the Blackboard Patent. Jim Farmer [20 kB PDF], who wrote The new "post-patent" environment for e-learning: a perspective as a Fortnightly Mailing Guest Contribution in September of this year, has done a brilliant job of summarising the debate between Moglen and Small [190 kB PDF]. (Notes from Moglen's keynote will be available in due course, and I will post a link to them from this piece.) The debate, which is relevant to the situation in Europe rather than just the US, provides plenty of insights into "the software patents question". Sakai has done us a service by organising it; and Blackboard a service by taking part in it (whatever you think about the logic or justification for the Blackboard patent, you have to admire Small for going into the lion's den and patiently holding his and Blackboard's ground, albeit with a much more reasonable tone than is used by the lawyers that Blackboard instructs [63 kB PDF]): and it emphasises that the dispute, in which Moglen is vigorously confident of long term victory, is really between two world views, rather than between organisations, or about a particular piece of software. "Typically I try to summarize the key points from a presentation in notes like these. However, the important points are all subtle points of interpretation. I suggest you listen first to the audio recording of Moglen’s keynote for context and then the entire audio recording several times in conjunction with these notes to make your own interpretation. I have transcribed, with errors anyone unfamiliar with transcription and with only primitive software installed would make, the parts that I believe should be carefully reviewed. The further the presentation moved from Joseph Hardin’s introductory questions to confrontation, the more I thought you would find the points less obvious and the transcription useful."